I suppose some of you may wonder what I am knitting right now. Here is the progress report. I must say that I am allowing myself to cast on more projects at a time than I used to. There are just so many projects I want to make, and who cares if I do lots at a time? Do you? I didn’t think so. Can you tell I’ve been reading EZ? I am starting to sound like her. Cobblestone: I got about halfway up the body and realized it would have fit my dh, me and our dd all at once, so it’s been frogged. When I get over it, I will cast on again with smaller needles! Or maybe different yarn! I don’t know! Shawl Collar Cardigan: I have done quite a bit of the back, and it looks nice, but I have to admit I am ready for so much more than just stockinette stitch, that I am bored to tears knitting this. I have impulses to frog it and use the yarn for something else, probably for Amelia, but there is an awful lot of it. 12 balls, to be exact. Sigh. Chevron Scarf: This looks good, I like the color combo, but it seems it will take forever. I tend to lose interest after awhile, so I keep putting it down. Seamingly Simple Vest: I love the way the BMFA Twisted is knitting up. Very pretty. The saving grace of this vest is that it is done on large sized needles, otherwise the constant 2×2 rib could be enough for some homicidal ideation on my part. It is growing, but slowly. 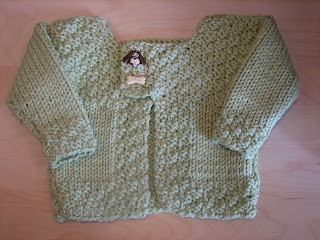 Baby Sweater (above): This is a delightful knit, especially given the boredom factor of all of the above projects. The box stitch gives it just enough to focus on without being too fussy. The yarn, Valley Yarns Sugarloaf, is a good fit. It feels like cotton, but has the stretchiness of wool. It is a bit splitty for my taste, but not terrible. I love the way it turned out! Thank Goddess for quick knits to break up the boredom. those dog & bone buttons are adorable!! I LOVE the baby sweater! I am a formerly employed therapist & a totally unrehabilitated fiber addict. Did you design the baby sweater? Where/how can I get the pattern? The buttons? Since I skip around to different projects, I am trying to build up a stash of baby items. My daughter (married for over 4 yrs. now) & her husband are trying for a baby. . .so. . .I better get busy. You can email me @ carohans@essex1.com Thanks!